The cabin was exactly what we we needed for a weekend getaway to celebrate my 30th birthday. The bed was very cozy and the bathroom spacious. We made breakfast and lunch at the cabin and had all we needed to prepare the meals (utensils, pans, pot holders, etc). We loved the hot tub and deck view. We followed Jill’s advice and fished at the nearby pond, visited the Cascades, and Rough Ridge. It was spectacular and can’t wait to come back. Highly recommended! 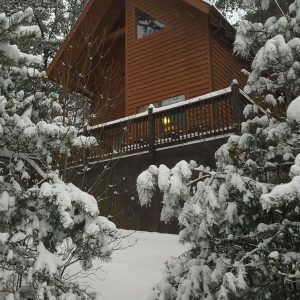 ← Our second time at this cozy cabin!